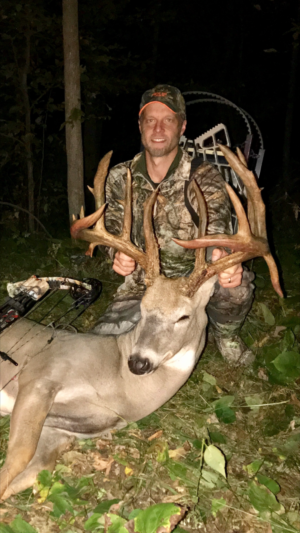 Opening weekend of archery season in Wisconsin has started, and with that, many eager hunters hit the woods in anticipation on getting into the stand in hopes of having a shot at a monster buck! Well for this lucky hunter in Burnett County he sure had the hunt of a life time! The morning of the 17th was more so an unsuccessful one. Widiker set his eyes that afternoon on a primary scouting mission around his property. Leader News Room says, with Widiker that bucks on his 80 acre piece of property usually doesn’t hold big bucks until later in the year. The bucks usually feed primarily on the neighboring bean fields that surround the parcel of land. Thats unless there is a nice acorn fall on his property. Widiker says, “One thing I do have is white-oak acorns” so he scouted for another place to sit for his evening hunt. With a quick search of the property a white-oak acorn ridge was found with ample amount of sign including a fresh scrape, and rubs all around. With his stand hung the wait began with the anticipation of what could happen next. Over the course of the hunt Widiker saw 15 deer in total many of which were small fawns and does. A quick snort wheeze call from Widiker allowed him to see a massive bodied deer working his way to him. Thats when it happened. With a huge range of emotion running through everyones veins Widiker finally bagged a buck of a lifetime. Through his patience, persistence, and knowledge Widiker walked away with a great story, meat in the freezer and a buck of a lifetime.